Loukhoum Parfum du Soir (shown above left) is in 30 ml Parfum Extrait, and is meant to be a "sensuous take on Loukhoum’s blend of rose, almond and vanilla". The notes include rose absolute, wardia rose, oudh, patchouli, white almond, vanilla Madagascar absolute, tonka bean and benzoin. $120. Loukhoum Eau Poudree (shown above right) is in 50 ml Eau de Toilette. "The soft and powdery aspects of the original are heightened and fluffed in this light, vibrant scent." Featuring notes of white rose, orris powder, violet leaves, narcissus, dragée (candied almond) notes, vanilla and crystalline musk. $80. 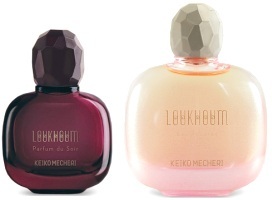 Keiko Mecheri Loukhoum Parfum du Soir and Loukhoum Eau Poudree can be found now at Luckyscent, where they are sold separately or in a trio gift set with the original Loukhoum in 50 ml Eau de Parfum for $290. I love almond notes, and a good, precious vanilla. I also love powdery fragrances. I'm probably the only person in the world who LOVES powdery so much. So this all means that I'd love to try them both: the extrait and the Eau Poudree. IrisNobile, I like powdery also. With me, though, sometimes the sweetness can be too much in powdery fragrances. The original KM Loukhoum was a bit too sweet for me. Still, I'd sniff both these new ones! I like powdery too. I do like the original Loukhoum and own a bottle, i ordered the Poudree, but i think i am first going to try a sample of the soir, before considering buying a bottle. Sometimes the Oudh can make it not so soft and depending on how much patchouli is in there it scares me a little since that combo sounds like an instant headache waiting to happen. But i will know more after trying a sample. Loukhoum has tons of fans though, as does LV's powdery one (name escaping me at the moment). So you aren't alone in loving powdery! Too sweet for me too. I'd like to try the Soir version though. Teint de Neige is a super powerdery LV that even I can't take. I always wish there was as shot of bitters in it. I've never tried it, but it's a given that KM Loukhoum is a lot sweeter than SL Rahat, right? Still, this new extrait sounds very nice. I've been having a hankering for something almondy for awhile: these are probably in a much different vein AdP Mandorlo di Sicilia has been on my wishlist for awhile, and I've also been curious about Castelbajac for the longest time. There is just something comforting about almond in fragrances. Castelbajac was my favorite for a long time and if you don't like super sweet you may like this one, its on the clean linen scent side, at least to me it smells very clean, not very sweet. Another pretty gourmand scent is Reminiscence Do Re, again the almond comes through quite a bit on this one. Thanks — could not call that name up! It could be very heavy, you're right.